Overnight, last night, Facebook rolled out its long-awaited Facebook Lite — a new, faster, stripped-down version of the social networking site. Open at first only to users in the US and India, Facebook Lite is now available to all English-language users. First reactions to Facebook Lite seem to be mostly positive, albeit with the inevitable comparisons to Twitter’s lean message stream. 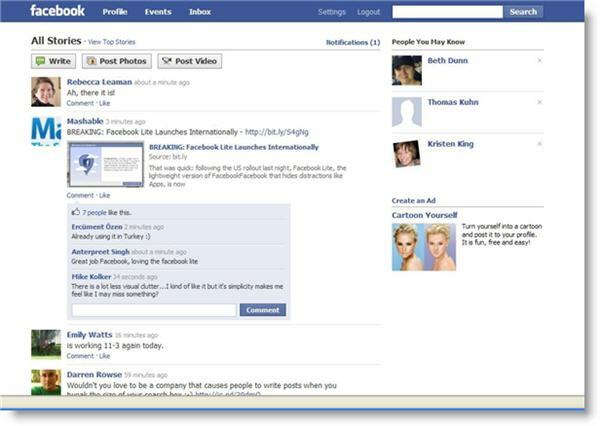 You may find some features that you use regularly are missing from the Lite version of Facebook, but the company says that the various versions of its website are intended to be used side by side — you might use regular Facebook on a home computer, the mobile or touch-screen versions on the road, and Facebook Lite where your Internet connection is iffy or when your time is limited. So, what’s the point of Facebook Lite? According to statements from Facebook, one of the main motivations behind the launch of Facebook Lite was to make it easier for new people to use the network, to sign up and login for the first time and immediately be able to start making connections. Given the fact that Facebook has been growing like the proverbial weed — even though its use is not exactly intuitive, and it’s nearly impossible to explain the fine points of using it effectively — you’ve got to figure that Facebook Lite could lead to an even faster expansion. Especially in “international” users, for whom highspeed, wide-bandwidth Internet access is less readily available that it is in, for example, urban parts of North America. "Full meal deal" or "diet plate"? Your choice! But that’s the down side of trying to serve a large and diverse community of users, isn't it? Trying to balance the demand for new features and functionality with the basic requirements of access and usability is always a tricky business. Over at MySpace, for example, users have long had the ability to customize their profiles, and to embed rich media. It makes the network very attractive to musicians and artists, and their fans, who can put a personal stamp on it and share their enthusiasms in multimedia. But that flexibility also meant that MySpace profiles became increasingly bloated, and have been famous for loading painfully slowly. So — back in mid-April, and without nearly the hype that’s attending the launch of Facebook Lite — MySpace added a nav bar button to let users choose between the regular page view and a faster-loading Lite version. Time and bandwidth are two of the most precious commodities we’ve got these days — and both are in increasingly short supply. It’s no surprise that Facebook has also chosen to offer its users yet another way to experience the social network. We're looking at, basically, an easier way for more people to get on Facebook and "get up to speed" with it, in several meanings of the phrase. What do you think of Facebook Lite? If you've had a chance to try Facebook Lite, how do you like it so far? 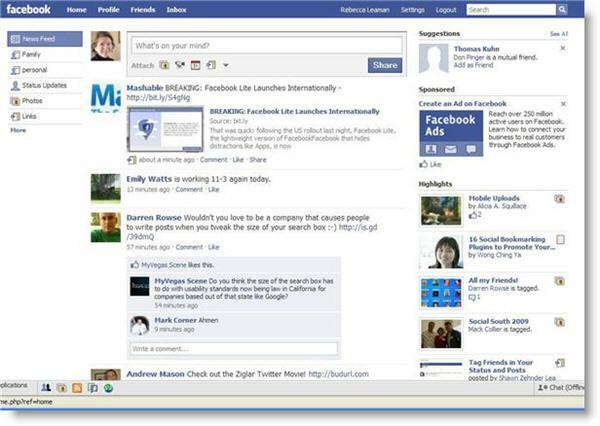 Do you think the availability of a Lite version might change the way your organization uses Facebook? First impressions are positive. It's a cleaner interface, which I like. For people who are less focused on Facebook apps, this could be really useful. I think Facebook Lite is great for the home page news feed and for my own personal profile page. However, I'm less than impressed with how it presents our organization's fan page. It seems to cut out much of the useful navigation for our page and not do as good of a job with posts and encouraging discussion. What does everyone else think? A link to pages and groups is needed or a tab. Thank you very much for spreading the word about Face Book Lite. Your article is informative and is useful for readers. I agree with Dennis here that links to the pages are needed for more help especially for beginners.